I will get this out of the way now, and say that while in Europe we did not attempt to set foot in one art museum. I KNOW. It’s probably some sort of crime against traveling or something. Amsterdam, Paris, Barcelona, and NO ART MUSEUMS? Please don’t lynch me. I don’t have anything against art, and I generally enjoy museums when I end up in them, but I am far from an art buff. So frantically dashing and battling the busses of tour groups for a glimpse of a Van Gogh, Rembrandt, Rodin, Da Vinci, Picasso or Dali behind 12 inches of glass from 10 feet away just wasn’t our style on this trip. I was far more interested in wandering around and taking in the feel of a place surrounded mostly by locals, instead of other tourists, taking in the scenery, buskers and street art of the cities. And there seems to be no better place to do this than Paris. I spotted three space invaders in Montmartre, along with a number of other fun pieces, and there was a constantly rotating display of works of art that would appear and disappear on the walls of La Passage des Abbesses. And of course, there are the big tourist sights: The Eiffel Tower, L’Arc de Triomphe, Sacre Coeur, Notre Dame. 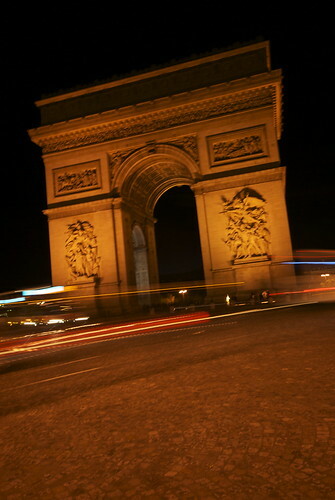 L’Arc de Triomphe is interesting, though the most fun thing about it is watching the insane roadway antics in the Etoile traffic circle. Five points of entry/exit, no lines on the road, and unlike most other places in the world, you drive on the right-hand side, but also yield to traffic on the right, which means it’s easy to get into the circle, and nearly impossible to exit! 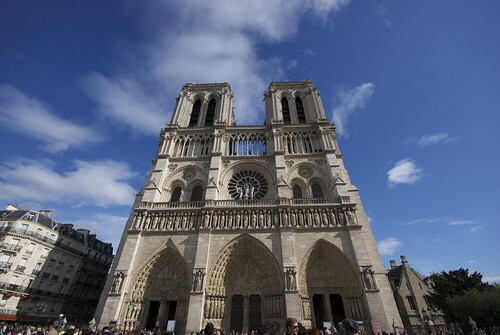 Notre Dame was also lovely, with its Flying Buttresses outside leading to a beautiful, cavernous sanctuary inside. Again, it wouldn’t have been a highlight for us, except they happened to have an Organ recital while we were there as part of a Saturday series of auditions for a new church organist. While I’m not particularly religious, there are few things more inspiring than sacred music in sacred spaces, especially played on one of the world’s biggest and best pipe organs. 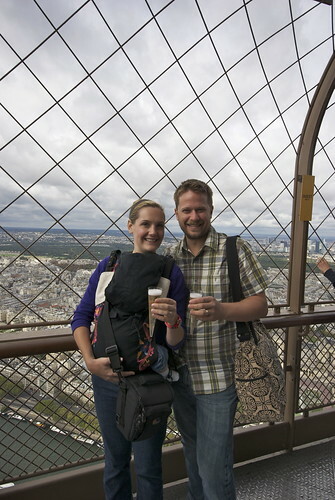 We also climbed the towers (all 400+ stairs, no lifts, as you’re warned approximately 12 times before going in – though it didn’t seem that bad) to take in the sweeping views of Paris from the towers and gawk at the Chimera gallery. Sacre Coeur is another beautiful viewpoint (are you sensing a theme here?) 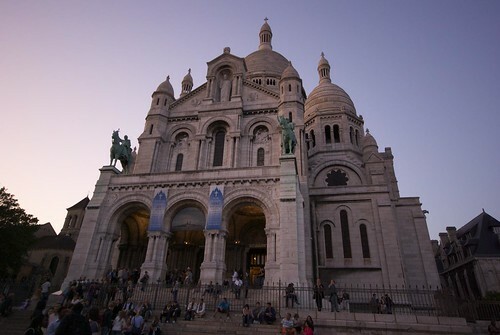 for gazing over the city, and while we never actually made it into the church, we spent an afternoon and an evening here on the steps with wine and baguettes taking in the view from the grassy lawn over the bustling tourist streets of Montmartre and across Paris. But among them all, the Eiffel Tower is, hands down, the most impressive structure I have ever seen. A lot of the time you have the postcard-perfect vision of a monument or attraction in your head when you travel; tourists and hawkers removed, surrounding sprawl cropped out, no scaffolding or repair work happening. And when you finally get there, the actual sight ends up being a bit disappointing. It’s how I felt about all the aforementioned attractions, and it’s not unique to Paris. Not so with the Eiffel Tower. Its size is already massive enough to make anything nearby inconsequential, and it’s situated on a huge grassy mall that isolates it from the distraction of its neighbours. Yes, the site immediately beneath the tower is tourist line-up central, but we went expecting that and didn’t mind it too much. It really is a push and shove and hurry-up-and-wait experience on the viewing decks, too. All worth it for the stunning vistas and to say you’re on the top of the freakin’ Eiffel Tower while you marvel at the engineering genius that put it up in 1889. All 324 Metres of the Iron Lady, lit up like a beacon, smacks you between the eyes. And then on the hour it starts to sparkle like a damn Christmas Tree. It is one of the most spectacular things I have ever seen. I could’ve ended the trip right there and been happy. But then I’d miss the fun we had coming up in Barcelona! 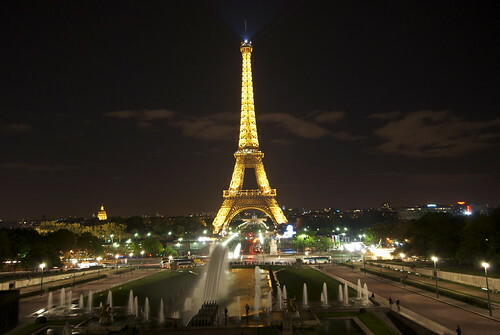 I loved Paris when I was there as a teenager, and I love reading about your trip. Brings back many memories and makes me want to plan a trip back someday soon. Where’s your favourite place in Vancouver for pastries? Well, I’m not a pastry snob, and haven’t had a *bad* pastry, but lately I like Plaisir Sucre on Arbutus/10th. It’s French, and tasty, and close! Perhaps too close, considering the lack of French stairs to counteract the French Pastry. I was the same way when I went to Europe this summer. I didn’t visit any of the wonderful art museums that I had heard so much about. I found myself much more interested in learning about the current culture and people living in the area. I would have liked to have visited the museums, but there are only so many hours in a day.